This page attempts to record what is known about the origin and history of the origami design variously known as Komoso, Komuso or Yakko-san. Please contact me if you know any of this information is incorrect or if you have any other information that should be added. Thank you. According to Wikipedia the komoso were a group of Japanese mendicant monks of the Fuke school of Zen Buddhism who flourished during the Edo period of 1600-1868. They were characterized by a straw bascinet (a sedge or reed hood named a tengai or tengui) worn on the head, manifesting the absence of specific ego. They were also known for playing solo pieces on the shakuhachi (a type of Japanese bamboo flute). These pieces, called honkyoku ("original pieces"), were played during a meditative practice called suizen (as opposed to reflective silent meditation) and 'that these monks 'were known first as komoso, which means "straw-mat monk". Later they became known as komuso, which means "priest of nothingness" or "monk of emptiness". The 'hood' of the origami komoso design is presumably a representation of the straw hat that characterised these monks. In the entry for Yakko-san in his Complete Origami (1987) Eric Kenneway calls Yakko-san 'a traditional Japanese clown' and states that 'according to one source, the folding method may have originated in the Muromachi Period (1394-1572).' Unfortunately the source of this information is not given. 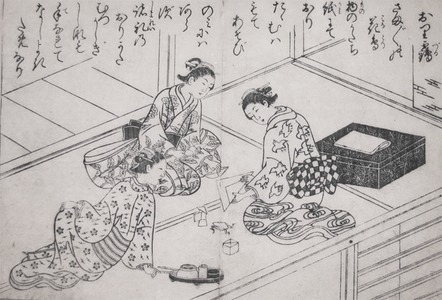 This print by the Japanese designer Nishikawa Sukenobu (1671-1750) shows ladies folding paper. Among the designs they have folded is Komoso. This print probably dates to around 1720 but can be no later than 1750 when Nishikawa Sukenobu died. The Komoso also appears in a Japanese book by Hayato Ohoka called 'Ranma Zushiki' which contains prints of decorations intended to enhance sliding room dividers, and dates from 1734. One of these prints shows a group of folded paper objects, among which are Komoso, the Crane, the Paper Boat and a Tematebako cube. Komoso is pictured twice, once folded in half and once flat. 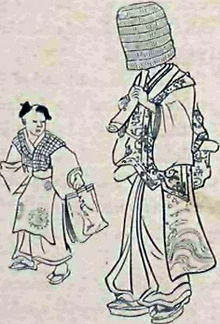 Komoso can also be seen in this detail from a print known as 'The Doll Festival', from the book 'Ehon masu kagami, vol. I', also by Nishikawa Sukenobu, which is in the possession of the Museum of Fine Arts in Boston, and can be dated to 1748. 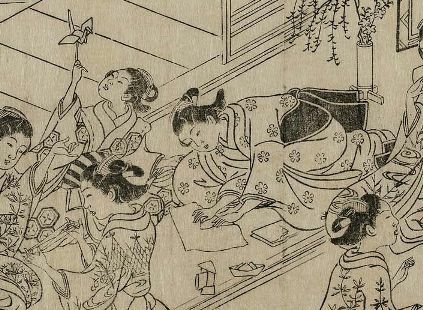 Komoso also appears in this detail from another print by Nishikawa Sukenobu, 'Ehon Hana no Kagami', which was also published in 1748, and which shares many charactristics of composition with the print above. I have not been able to discover any evidence as to when the non-folded-in-half version of the design was first called Yakko-san. Yakko was a (perhaps derogatory) name given to the low-status servants of Samurai during the Edo period. The Komoso design is listed on page 24 of the Kan no mado (usually dated to 1845) as one of the designs omitted from the ms on the basis that they are already well known. In the modern era diagrams for Yakkosan (sic) appear in Isao Honda's 'The World of Origami' published in 1965 by Japan Publications.